Infrared food thermometers have been used in the food service industry and by professional chefs for years but until recently have been too expensive for home use. Now with ever lowering prices it's becoming more and more common for the regular consumer to own one. You may have never considered one for your own kitchen or may not have ever even heard of one but you love to cook or even if you don't love it but do a lot of cooking this is one cooking thermometer that you will wonder how you ever got along without. To help those that have never heard of infrared food thermometers and those that have always wondered how they work here is a short description of this wonderful technology. Basically infrared is light that can not been seen but that we feel has heat. Everything puts off a measurable amount of infrared energy, think night vision cameras, that's were an infrared food thermometer comes in. It measures the amount of infrared energy coming of an object, like the food you're cooking and translates that into a temperature measurement. Most have a built in laser pointer that's only purpose to help with aiming. Just point the eye of the thermometer and what ever it is you want a temperature of pull the trigger and read the temperature on the screen it's that simple. This is what makes infrared food thermometers so great they are a fast and safe non-contact way of measuring surface temperature. You might be asking yourself why you would need this type of thermometer with all the other types of food thermometers. The reason is consistency. If you cook something the same way ever time and that includes the temperature of the things like the skillet and oven, then you know how it will turn out no more guessing. So the next time you cook that Sunday dinner for the in-laws you know it's going to be great. Now let's take a look at some of the best infrared food thermometers available that won't empty your wallet. First the Kintrex IRT0421 Non-Contact Infrared Thermometer with Laser Pointer, this rugged, ergonomically designed, easy to use model is compact, light weight and designed to measure accurately from a distance. With a -76 to 932 °F temperature range and a response time of 1 second you would be hard pressed to find many things you couldn't measure the temperature of. A bright backlit LCD screen displays both the current and maximum temperature. It uses two AAA batteries instead of the more commonly used 9-volt and has been designed for increased battery life. And the kitchen isn't the only place for this infrared food thermometer, it can be used in the garage for automotive diagnostics, HVAC and electrical trouble shooting. To find the best price on your own Kintrex IRT0421 look online. Amazon carries it for around fifty dollars and of course you can find any thing on eBay. With its two year warranty and low price this is the time to step up your cooking game. 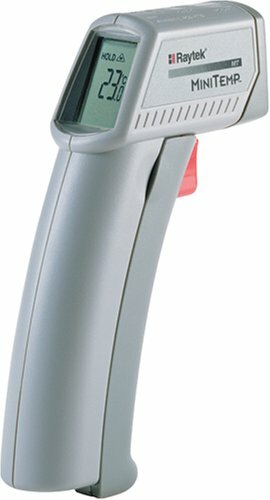 Next on the list of infrared food thermometers is the Mastercool MSC52224A Infrared Thermometer. 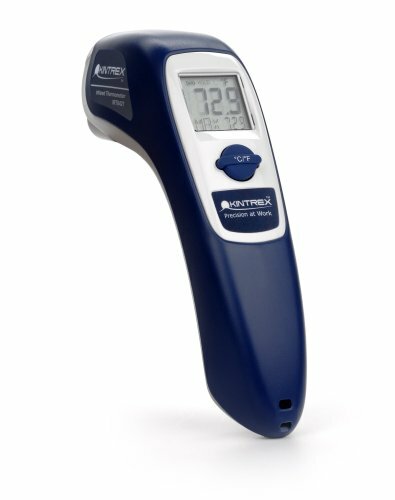 With many of the same features as the Kintrex model this non-contact thermometer has a temperature range of -58 to 932 °F with a one inch LCD screen, is powered by two AAA batteries and comes with an a plastic molded storage case. Available online this unit cost around forty five dollars. This is by no means all the infrared food thermometers available. With a little looking around online you will discover just the right one to fit your needs.